This species grows to 10cm in length. 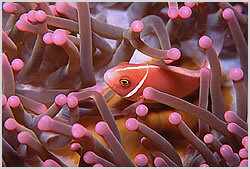 The Pink Anemonefish inhabits coral reefs and is usually associated with the anemone Heteractis magnifica . It is sometimes seen associated with three other anemones: Heteractis crispa , Mactodactyls doreenis and Stichodactyla gigantea . Usually one adult pair and several juveniles are present in each anemone. It is found in depths from 3m to 30m. Pink Anemonefish feed on benthic algae and zooplankton. This fish occurs in tropical marine waters of the Western Central Pacific, from the Philippine Islands, north to Japan, throughout Micronesia, south to Australia and east to the Samoan Islands. Distribution: Indo-Pacific: Christmas I. in the eastern Indian Ocean to southern Japan, Ryukyu Is., Taiwan, Philippines, Gulf of Thailand, Indonesia, New Guinea, New Britain, Solomon Is., Vanuatu, New Caledonia, Caroline Is., Marianas, Kiribati, and Marshall Is.